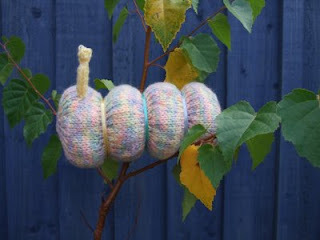 Here's my pattern for an easy Colin Caterpillar with I-Cord anntenae - please leave me comments if you spot any errors - thanks and happy knitting! ~Cast On 15 stitches and split evenly onto 3 DPN's, you may like to place a stitch marker at the beginning of the round to help later. ~Increase Round - M1 into every stitch, you should now have 30 stitches, 10 on each needle. ~Increase Round - M1 into every stitch, you should now have 60 stitches, 20 on each needle. ~Decrease Round - K2TOG from start to finish until you have 30 stitches. ~Decrease Round - K2TOG from start to finish until you have 15 stitches. ~Decrease Round - K2TOG 7 times until last stitch, K1. 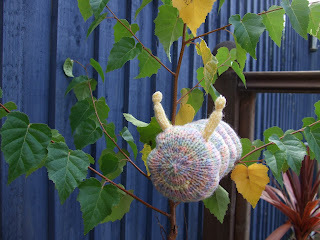 ~Cut off yarn leaving a 20cm tail and thread this tail through the 8 stitches, drawing tight to close off head. ~Stuff body and add any noise makers. ~Tie ribbon around bumps to help define them.